They’re like two shiny gold crowns amongst rows of pearly whites. The Idyllwild Arts Transportation Department has just added two new vans to their fleet. 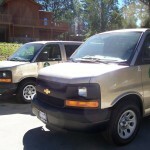 However, instead of the standard white GM vans, these vans are gold Chevrolets. Tucker McIntyre, head of Transportation, is pleased about the new additions to his fleet of 13 vans and cars that service the Idyllwild Arts student body. 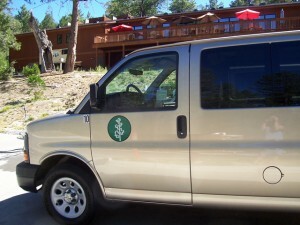 Vans are used to transport students to and from LAX, Ontario and Palm Springs Airports. They’re also used for field trips, weekly music lessons and trips to the doctor and dentist–just about everything students need in a boarding school. With these two new additions, Tucker gave up an older white van to the Film Department. 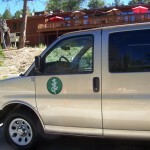 Film students need a van at their disposal to transport cameras, tripods and other film equipment while they’re shooting on location. “It just makes sense for them to have one at their disposal,” Tucker said. 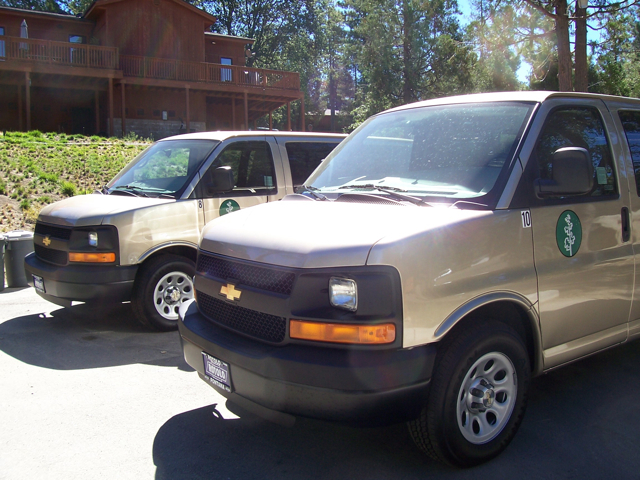 The two new gold vans are a physical reminder of the ongoing excellent service the Idyllwild Arts Transportation Department provides. “We’re setting the gold standard for service,” Tucker said with a smile. He often gets good comments about the friendliness and professionalism of his drivers, many of which have been with him for years. The two new vans will sport the numbers 8 and 10. Neil will drive number 10 on a regular basis. Neil, who was born in Peru, is a big soccer fan, and is thrilled to be driving a new van. He’s been waiting for this day to come for months. However, his waiting is not over yet. The new gold vans have not been road tested. “We’re still waiting on all of the papers,” Tucker said, referring to their registration and insurance papers. When the snow comes, rest assured these all-wheel-drive vehicles will be able to get us around, Tucker added. This entry was posted on Monday, September 20th, 2010 at 8:58 am and is filed under Idyllwild Arts Academy. You can follow any responses to this entry through the RSS 2.0 feed. Both comments and pings are currently closed.